MacroPoint, creators of patented freight tracking software designed to give third party visibility into load status by tracking the location of a driver’s mobile phone, including flip phones, or existing in-cab ELD/GPS devices, today announced it will be the Official Logistics Track & Trace Provider of the No. 47 JTG Daugherty Racing NASCAR Sprint Cup Series team, tracking the trucks that haul for the Harrisburg, N.C. racing organization all over the country weekly during the 36-race schedule from February to November. 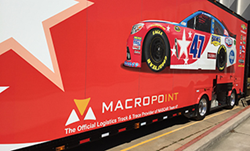 For the 2016 NASCAR Sprint Cup Series, drivers of the JTG Daugherty Racing trucks will be partnering with MacroPoint to MacroPoint Enable every trucker on the road. To follow the JTG Daugherty Racing team as it is tracked by MacroPoint, visit http://www.MacroPointRacing.com as they compete in the NASCAR Sprint Cup Series with an ECR Engines powered Chevrolet driven by AJ Allmendinger. The team is owned by Tad and Jodi Geschickter along with former NBA player and current ESPN on-air talent Brad Daugherty. Used with a driver’s mobile phone, including flip phones, or existing in-cab ELD/GPS devices, MacroPoint’s patented location monitoring and tracking software gives third parties load status and location visibility on their shipments. With MacroPoint, brokers, 3PLs and shippers have real-time location tracking, delivery monitoring, and event notifications that enhance the efficiency and profitability of their operations. Founded in 2011 and headquartered in Cleveland, Ohio, MacroPoint is the provider of a patented, automated platform that enables worldwide freight monitoring and tracking for shippers, brokers and 3PLs. MacroPoint load monitoring software is a ‘pay per use’ solution that works on any cell phone, not just smart phones, and with existing in-cab ELD/GPS tracking devices. The real-time location tracking, delivery monitoring, and event notification solution is integrated with a wide range of TMS systems, automating the entire process and eliminating the need for drivers to check in with dispatchers, and for shippers and brokers to check in with carriers. To date, over 500,000 driver cell phones have been setup by thousands of brokers, shippers and trucking companies using MacroPoint to track their freight, and millions of trucks are MacroPoint enabled via their in-cab ELD devices. To learn more about MacroPoint’s industry leading solution for third party shipment tracking, call 866-960-0328 or visit http://www.macropoint.com.